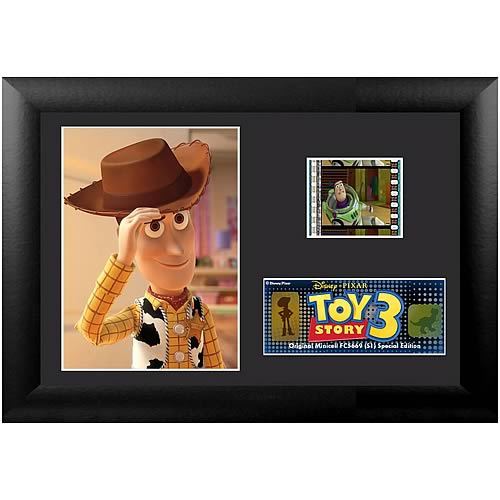 Shopping for Toy Story Film Cells? The creators of the beloved Toy Story films re-open the toy box and bring moviegoers back to the delightful world of our favorite gang of toy characters in Toy Story 3. As Andy prepares to depart for college, Buzz, Woody and the rest of his loyal toys are troubled about their uncertain future. Directed by Lee Unkrich, Toy Story 3 is a comical new adventure that lands the toys in a room full of untamed tots who can't wait to get their sticky little fingers on these 'new' toys. its pandemonium as they try to stay together, ensuring 'no toy gets left behind'. The film strip portrayed in the image above is only an example of the film cells you may receive. Please note, the cells may vary from piece to piece because they are hand selected from reels of film. This item contains clips of the film and portrays memorable images and scenes all on a stunning descriptive plaque. These elements have been double mounted and placed within a beautiful black wood frame measuring 7-inches wide x 5-inches tall. The Toy Story 3 Series 1 Special Edition Mini Cell even comes with a certificate of authenticity.